Apple is criticized for not catering to gamers — and rightly so — but you might be surprised to learn that Macs do have the potential to be great gaming machines. Even portables like the MacBook can become high-end gaming rigs, thanks to the Wolfe. 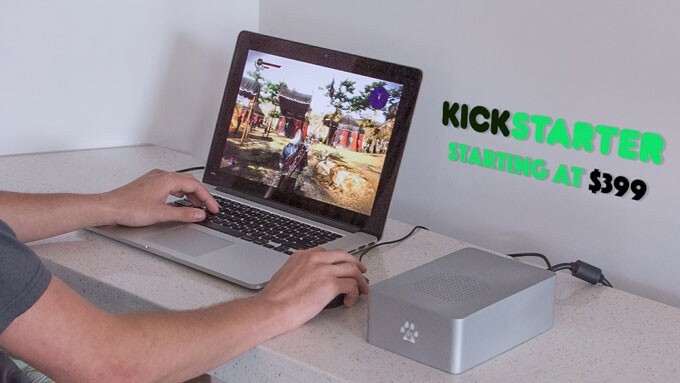 The Wolfe combines your Mac with a real desktop GPU — the same kind of video card found in dedicated gaming or video editing machines — making it immensely more powerful than it typically is with the integrated graphics Apple provides. As standard, the Wolfe comes equipped with an NVIDIA GeForce GTX 950 GPU, but there’s also a Wolfe Pro, which is equipped with a GeForce GTX 970. Later, you’ll also be able to get the Wolfe with NVIDIA’s new GTX 1060. Alternatively, you can pick up the Wolfe DIY, which gives you all the parts you need to connect your own GPU to a Mac. The Wolfe provides up to five times the graphical performance of a typical notebook, while the Wolfe Pro can deliver up to ten times the performance. This becomes really apparently in benchmark tests like Heaven. While a 13-inch MacBook Pro with Intel Iris Pro 5200 graphics can deliver less than 15 frames-per-second in these tests, the same machine with the Wolfe can deliver over 50 fps. Hook up the Wolfe Pro and you can expect well over 70 fps. The Wolfe is even powerful enough to make the Mac compatible with Oculus Rift and HTC Vive virtual reality headsets. Getting setup with the Wolfe is as easy as plugging it into your Mac using the Thunderbolt connector, then connecting the power cable. It’s that simple! The Wolfe is currently available on Kickstarter, with prices starting at $399 for the standard model and $449 for the Wolfe Pro. The Wolfe DIY costs just $269, but of course you’ll need to provide your own GPU. This entry was posted in Apple news and tagged GeForce GTX 950, GeForce GTX 970, GPU, Graphics, Kickstarter, Macbook, nvidia, Wolfe. Bookmark the permalink.